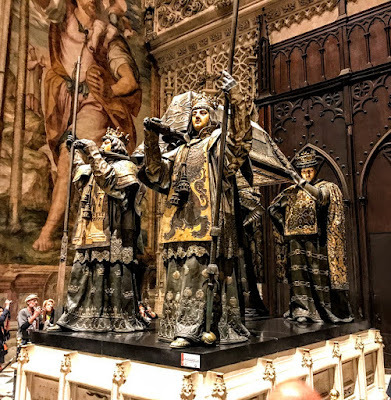 Having spent Wednesday morning in Seville Cathedral, I spent much of the afternoon [24 October 2018] in the Alcázar or Reales Alcázares de Sevilla or Royal Alcázar of Seville. 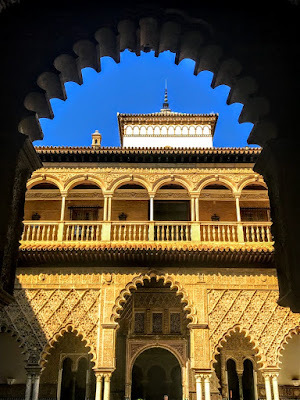 This royal palace was built for King Peter of Castile on the site of an Abbadid Muslim fortress that was destroyed during the Christian conquest of Seville, although elements of other civilizations remain. The name Alcázar comes from the Arabic al-qaṣr, meaning the castle or palace, which in turn is derived from the Latin castrum, castle. It is said the site of the Real Alcázar has been occupied from the eighth century BC. The collegium or College of Olearians was built here in the first century AD, and the early Visigothic basilica of Saint Vincent was built on its ruins. When Seville was conquered by the Umayyad caliphate in the year 712, the Visigothic basilica was demolished to build the first military work. It This may have been a quadrangular enclosure, fortified, and annexed to the walls. During the period of the first Taifa kingdoms, various buildings stood here, including stables and warehouses. The citadel began to gain importance, under the Abbadid dynasty in the first half of the 12th century, when the space doubled and a large palace called Al-Muwarak was built on the site of the present Patio de la Monteria. Some archaeological remains from this period are preserved. Under the Almohads, when Abu Yusuf Yaqub al-Mansur was caliph, a new residence, court and mosque were built for the Caliph. A small courtyard, the Patio del Yeso, served as the residence of Pedro I in 1358 before his new palace was built. 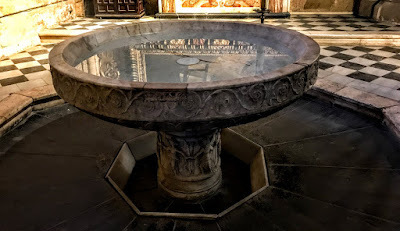 When he was building this new palace, he reused some of shafts and capitals of this basilica, the only Visigothic remains to have survived to this day. 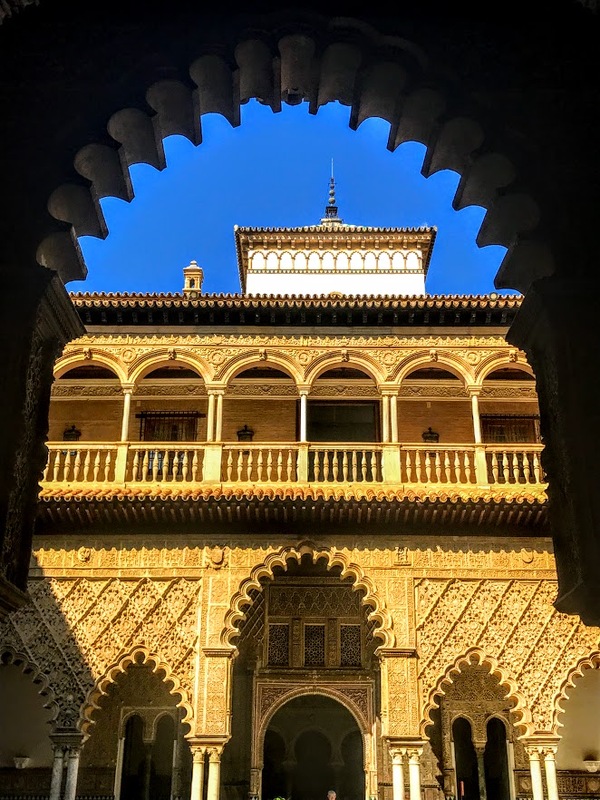 Most of the architecture of the palace, including its most flamboyant parts, was built for Peter of Castille and Alfonso X and includes Mudéjar, Gothic and Mannerist halls and courtyards. After the Lisbon earthquake caused damage in 1755, the façade of the Palacio Gótico overlooking the Patio del Crucero was completely renovated in Baroque style. We entered tAlcázar by the Puerta del León, the main entrance, which takes its name from the 19th century tile-work inlaid above it, showing a crowned lion holding a cross in its claws and bearing a Gothic script. The Patio de las Doncellas or ‘Courtyard of the Maidens’ takes its name from a legend that the Moors demanded 100 virgins every year as tribute from the Christian kingdoms in Iberia. The lower level of the Patio was built for King Peter of Castile and includes inscriptions describing Peter as a sultan. There are lavish reception rooms on the sides of the Patio. In the centre is a large, rectangular reflecting pool with sunken gardens on either side. 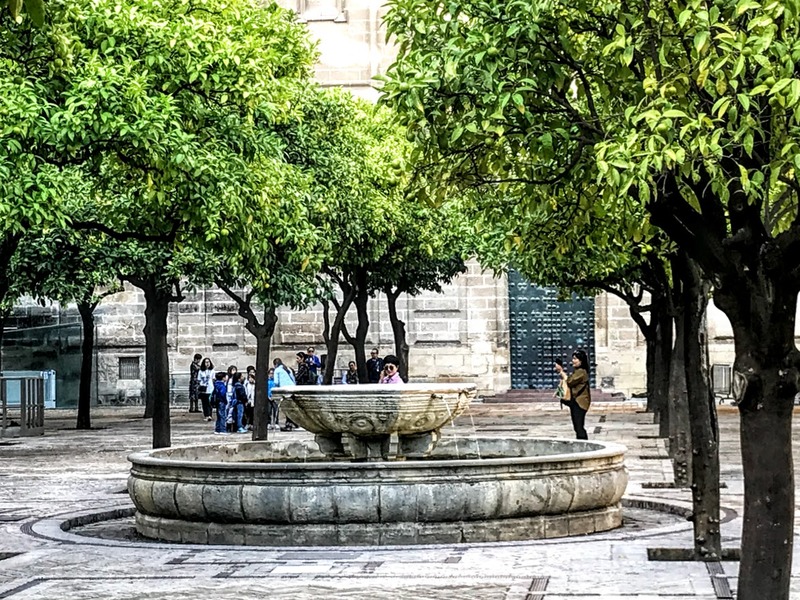 For many years, the courtyard was entirely paved in marble with a fountain in the centre. However, we were told during our tour that archaeological evidence shows the gardens and the reflecting pool were part of the original design and these have been restored. The upper story of the Patio was added by Charles V and designed by Luis de Vega in the style of the Italian Renaissance. Los Baños de Doña María de Padilla or the Baths of Lady María de Padilla consists of rainwater tanks beneath the Patio del Crucero, and is named after María de Padilla, the mistress of Peter the Cruel. The Salon de Embajadores, or Ambassadors’ Reception Room, was the main room used by Peter of Castile when he stayed at Alcazar. The gardens at Alcázar have undergone many changes over the century. During the reign of Philip III in the 16th century, the Italian designer Vermondo Resta introduced the Italian Mannerist style. 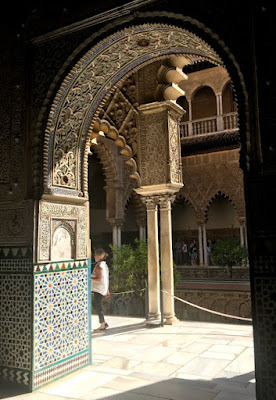 Resta was responsible for the Galeria de Grutesco (Grotto Gallery) transforming the old Muslim wall into a loggia from which to admire the view of the palace gardens. 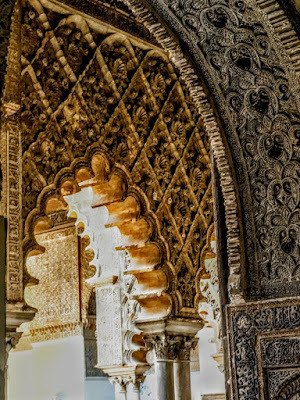 The palace is one of the finest examples of Mudéjar architecture in Spain and one of the most beautiful. 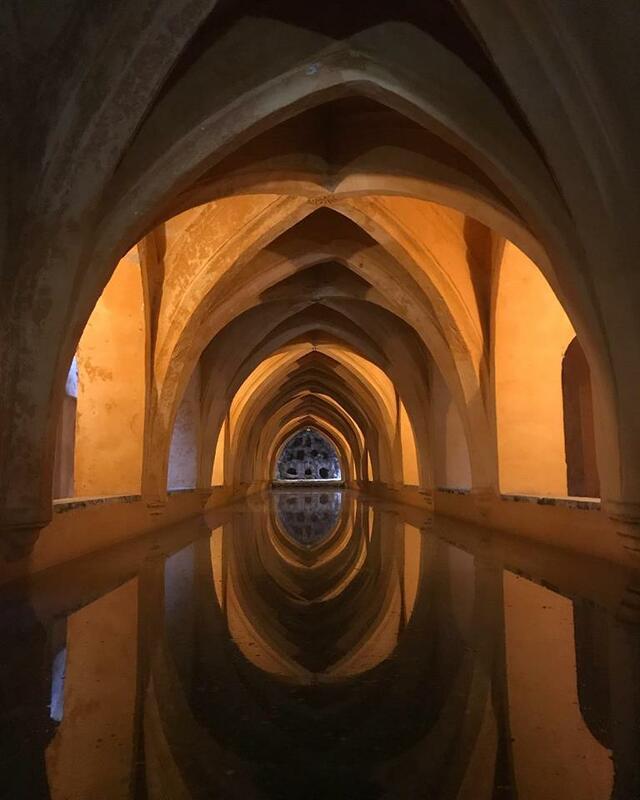 The upper levels are still used by the Spanish royal family as their official residence in Seville, making this the oldest royal palace still in use in Europe. 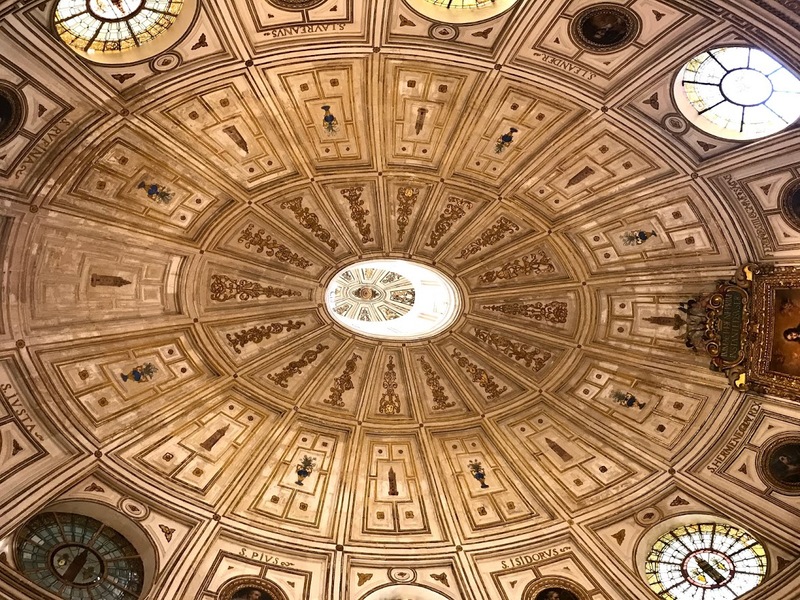 I was part of a guided tour of Seville Cathedral or the Catedral de Santa María de la Sede on Wednesday morning [24 October 2018]. This is the third-largest church in the world as well as the largest Gothic church. 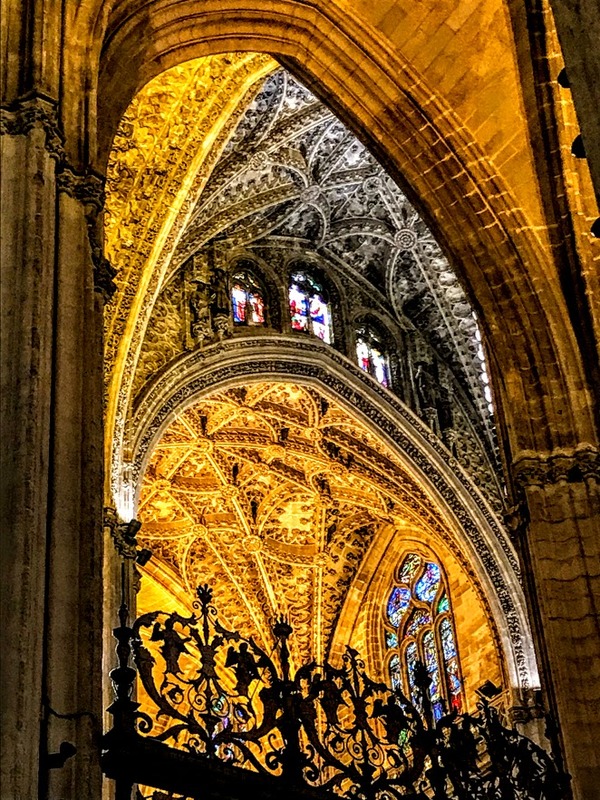 After its completion in the early 16th century, Seville Cathedral became the largest cathedral in the world, a title that had been held until then by Hagia Sophia in Constantinople for almost 1,000 years. 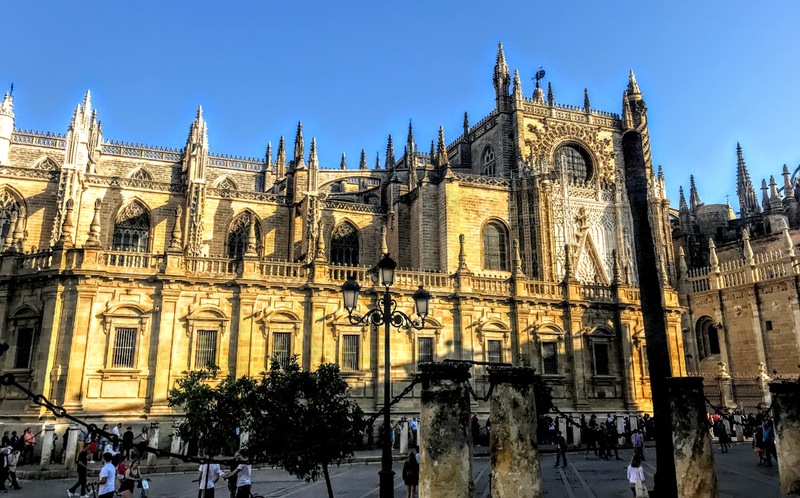 As the two largest churches in the world – the Basilica of the National Shrine of Our Lady of Aparecida in Brazil and Saint Peter’s Basilica in Rome – are not the seats of bishops, Seville Cathedral remains the largest cathedral in the world. The cathedral covers an expanse of 23,500 square meters, and the Gothic section alone is 126 metres long, 83 metres wide and is 37 metres high at the centre of the transept. 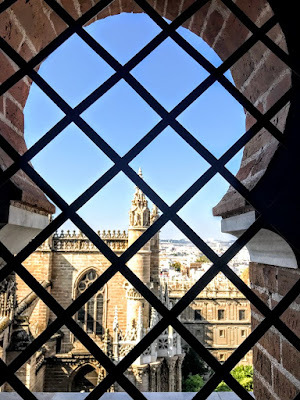 The total height of the Giralda tower from the ground to the weather vane is 96 meters. However, the cathedral site began life as a mosque, and the tour began in the Patio de los Narnanjos, or Court of the Oranges, where Muslim worshippers in Moorish times would wash their face, hands and feet in the fountain before praying. The Almohad caliph, Abu Yaqub Yusuf, ordered a new grand mosque to be built for the city in 1172. The new mosque was dedicated in 1182, but it was not completed until 1198. It supplanted an earlier mosque built in 829-830 by Umar Ibn Adabbas on the site of the present-day Church of Divino Salvador. The new mosque, which was larger and closer to the city’s Alcázar, was designed by the architect Ahmad ben Basso, with a minaret and ablutions courtyard. Its prayer hall had 17 aisles oriented southward, perpendicular to its Qibla wall, like many mosques in Al-Andalus, including the mosque of Ibn Adabbas. 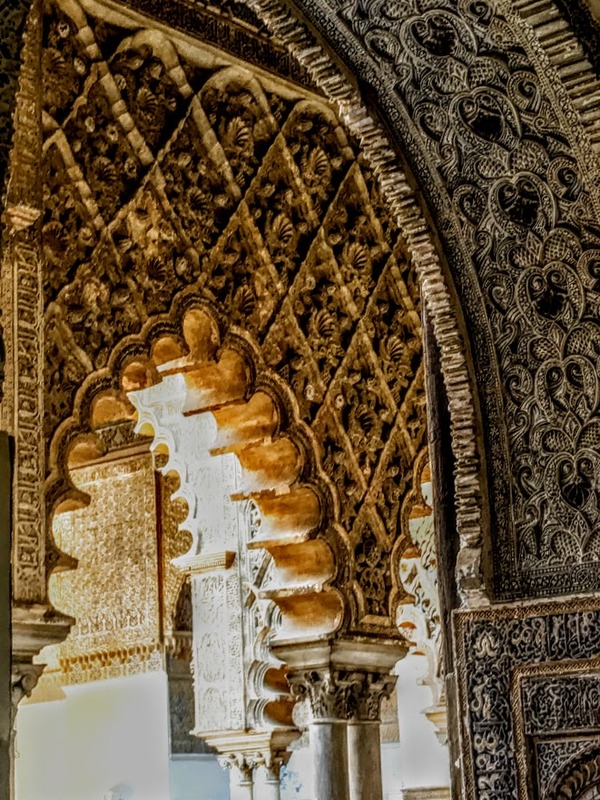 Shortly after Seville was conquered by Ferdinand III in 1248, Yaqub Yusuf’s mosque was converted into the cathedral. Its orientation was changed, the interior was partitioned and adorned to suit Christian liturgy and worship, chapels were created by erecting walls in the bays along the north and south walls, and almost the entire east half of the cathedral became the royal chapel where Ferdinand, his wife and Alfonso the Wise were buried. The city leaders decided in 1401 to build a new cathedral ‘so good that none will be its equal.’ According to local lore, the members of the cathedral chapter said: Hagamos una Iglesia tan hermosa y tan grandiosa que los que la vieren labrada nos tengan por locos (‘Let us build a church so beautiful and so grand that those who see it finished will take us for mad’). Building work continued until 1506. The clergy of the parish offered half their stipends to pay for architects, artists, stained glass artisans, masons, carvers, craftsman and labourers and other expenses. Several factors delayed the start of building work, including royal resistance to the temporary relocation of the royal chapel. But in 1434, King John II of Castille allowed the bodies to moved temporarily and stored in the cathedral cloister. Five years after building ended, in 1511, the crossing lantern or cimborrio collapsed and building work began again. The crossing collapsed again due to an earthquake in 1888, ‘every precious object below’ the dome was destroyed, and work on the dome continued until at least 1903. 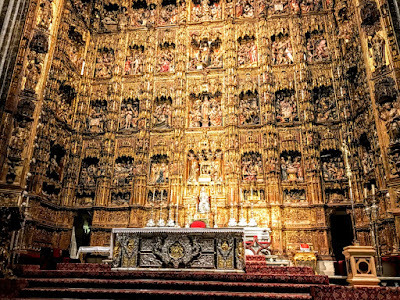 The High Altar or Retablo Mayor in the sanctuary or Capilla Mayor, is screened off by monumental iron grilles made in 1518-1532. Here Santa María de le Sede, the cathedral’s patron, sits above the altar and below a waterfall of gold. 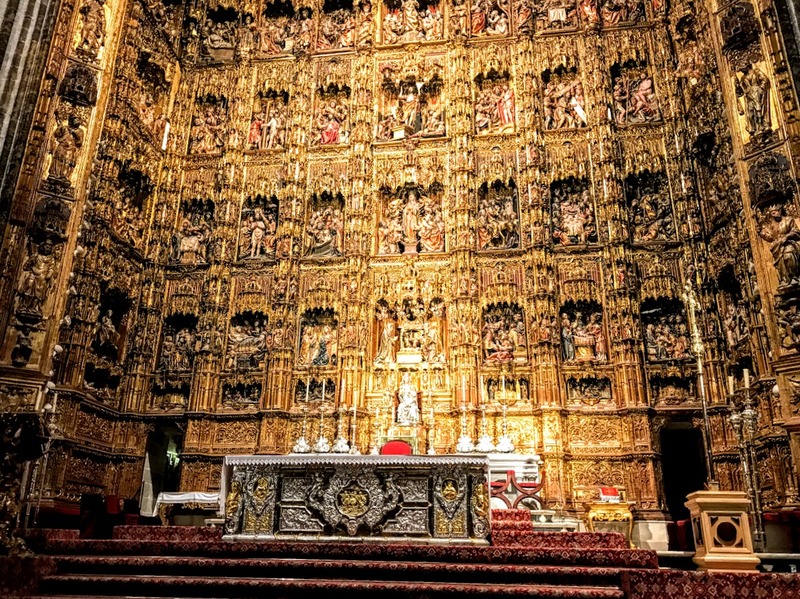 The 44 gilded relief panels were carved by Spanish and Flemish sculptors between 1482 and 1564. 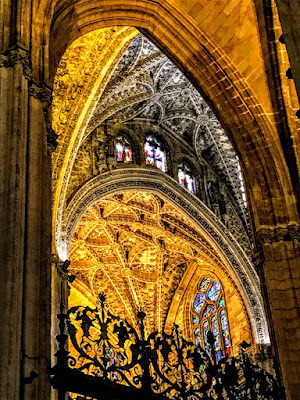 The cathedral has 80 chapels, including the Capilla Real or Royal Chapel. It was reported in 1896 that 500 masses were said daily in the chapels. The baptistery Chapel of Saint Anthony contains the painting of The Vision of Saint Anthony (1656) by Bartolomé Esteban Murillo. In 1874, it was discovered that thieves had cut away the portion depicting Saint Anthony, but it was recovered in New York a year later. 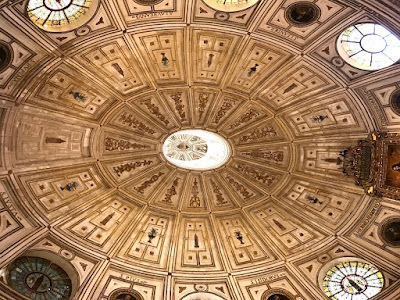 The royal chapel in the cathedral holds the tomb of the city’s conqueror, King Ferdinand III of Castile, his son and heir Alfonso the Wise, and their descendant, King Peter the Cruel. 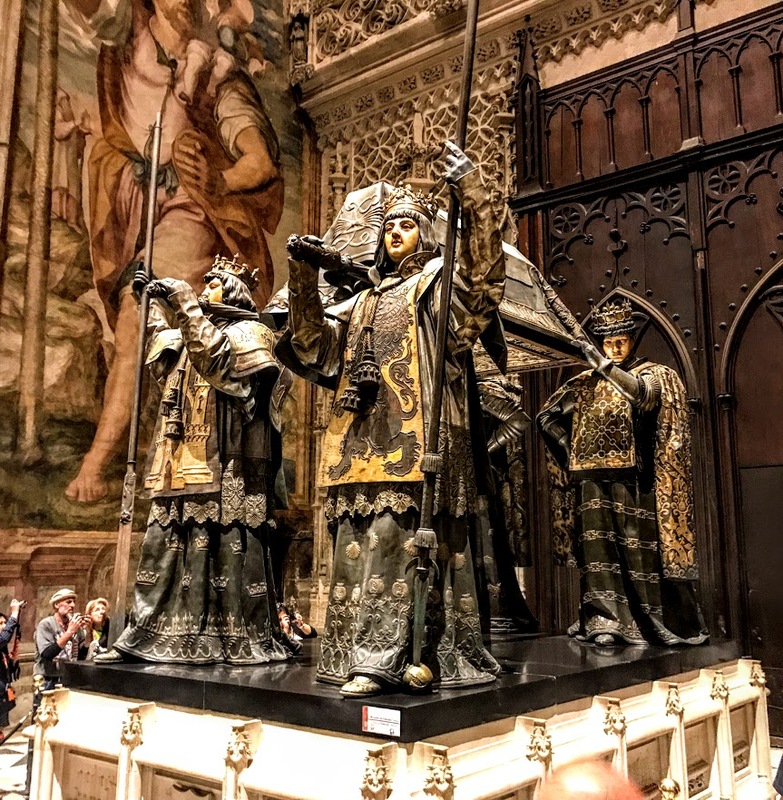 Christopher Columbus and his son Diego are buried in the cathedral, as are Cardinal Juan de Cervantes and Cardinal Pedro González de Mendoza Quiñones. 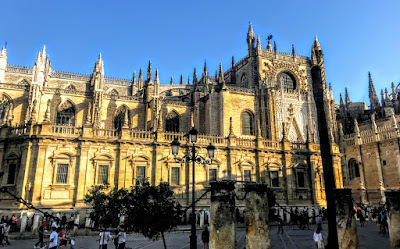 Seville Cathedral has 14 doors on its four façades. The major doors are: the Door of Baptism, the Main Door or Door of Assumption, the Door of Saint Michael or Door of the Nativity, the Door of Saint Cristopher or De la Lonja, the Door of the Conception, the Door of the Lizard, named for the stuffed crocodile hanging from the ceiling, the Door of the Sanctuary, the Door of Forgiveness, the Door of Sticks or the Adoration of the Magi and the Door of the Bells. After visiting the cathedral, I climbed to the top of the Giralda or bell tower of the cathedral, which is 104.5 metres high. The Giralda is the former minaret of the mosque and was designed to resemble the minaret of the Koutoubia Mosque in Marrakech. It was converted into a bell tower for the cathedral, although the top section dates from the Renaissance. Building work began in 1184 under the architect Ben Ahmad Baso, and it was completed on 10 March 1198. The belfry was added in the 16th century by the architect Hernán Ruiz the Younger. The statue at the top, ‘El Giraldillo,’ was put in place in 1568 to represent the triumph of the Christian faith.